Micro Underwater Light 2w 3000K St.St. 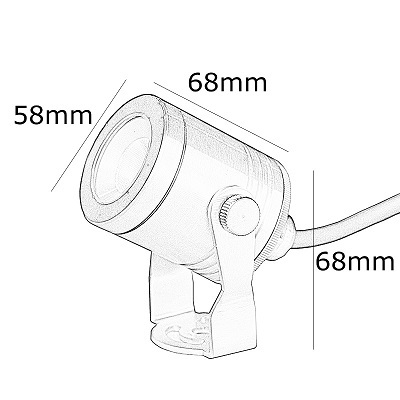 24v DC 200Lm.A lovely, inconspicuous luminaire, ideal for illuminating small trees and garden features, or for use as an underwater spotlight in fountains and waterfalls. The new Micro Underwater Light is a small, neat 2w LED IP68 fully submersible light made from high quality stainless steel. Fitted with a fully adjustable stainless steel stirrup bracket, and available with a choice of weighted, cast brass mounting bases – in either chrome plated or powder-coated black finish. A lovely, inconspicuous luminaire, ideal for illuminating small trees and garden features, or for use as an underwater spotlight in fountains and waterfalls.